Amber, JEWEL OF THE GODS: Amber is a tarry, natural sap residue from Pre-Cambrian trees which trapped insects, millions of years ago. Among the ancients, this fact was not understood. They knew it wasn't a mineral but they didn't know quite what it was. Some called it LYNX URINE! Being that there was no certainty about the genesis of amber, there were a number of folkloric hypotheses. The Ancient Greeks believed in the Myth of Phaeton, son of Helios. Once upon a time Phaeton stole his father's Sunny Chariot and rode into the sky. Unfortunately he lost control of the vehicle. The chariot fell down and burned the land of Africa (Sahara) and its people. That made Zeus furious. Phaeton was killed by Zeus’s thunder and fell into the river Eridan. His sisters, Heliadas, found his body. They cried so much after his death that the infuriated Zeus changed them into trees. Today their petrified tears are referred to as amber. We also know a Polish version of this legend. 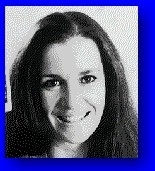 Once upon a time there was a beautiful princess called Jurata. She used to live in a marvelous palace made of amber. But she was very lonely and unhappy. One day she met a poor but handsome fisherman. They fell in love with each other. But when the mighty King of the Seas uncovered their affection, he was furious. He flung a thunder and killed the fisherman. Then he killed the princess and destroyed the palace, whose tiny pieces fell into the bottom of the sea. During storms, the Baltic Sea ejects pieces of amber onto the beach to remind us of the great love of that couple and the unrestrained power of the King of the Seas. 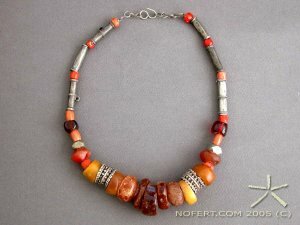 A genuine amber necklace can cost thousands but often you'll find artisans who collect old beads, assemble it and only ask 130$ as in the case of Sharleigh. The world's biggest amber stone - retinite - is called Burma Amber. It belongs to The British Museum in London. It weighs 33 pounds. The biggest Baltic succinite was discovered in Kamieñ Pomorski in 1860. It weights 21,5 pounds. There are plenty of amber-similars out there, some plastic, (they lose their color) some unidentifiable. THEY ARE GORGEOUS but what are they? AMBER, so it comes in RED, too! WHO KNEW? TECHNICALLY SPEAKING - Hardened Sap from modern day trees have Terpenes in the Sap, Until nature breaks down the Terpenes, it isn't amber. PRESSED AMBER IS MELTED DOWN AMBER - make sure you ask if it was mixed with Resin, if air was whipped/blown into it, if leaves or insects were added to it in the processing of the Amber ---if so - DON'T Pay Amber Prices. How to tell if Pressed Amber has had more help in being formed than a simple melting an forming process??? Well, It is getting harder to tell via just a photo - but here is a Tip- If there are too many 'bubbles' or 'things that look like internal chunks/slices', that's a dead give away that the Quality of the Amber is seriously compromised and/or just plain fake amber - Most amber I'm seeing in the last 2 years on the internet, is what I consider seriously Compromised Amber and the pieces are being Mass produced. Please note: I can not control the various Sellers Auctions that are Showcased on this Guide or other Guides- I have no knowledge of these auctions, their validity, value , etc. Copal is not Amber. Copal is the immature resin of a tree, being only a few hundred years old to a several thousand years old. Amber is the mature fossilized resin of an extinct tree and is millions of years old. Copal is plentiful, real Amber is not. There are so many Amber products (rings, pendants, bracelets, earrings, etc) for sale now adays, not just on Ebay but on piers in the Baltic, and in American shopping malls. It is hard to know what is REAL amber and what is manufactured. Real Amber, no matter the color, will show up as a either Blue or a Yellow butterscotch Opaque color under an ultra-violet light (most often it will show up as the butterscotch yellow) Copal will show up as white. So what else can you do to assure you are buying Natural Amber? 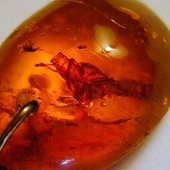 For one thing, bees, fish, scorpions, l izards, frogs, etc... are seledom found in Natural Real Amber. If you do find an insect in the 'amber' it will not look like a Freshly dead bug - remember you would be looking at a bug that has been dead for millions of years, and no doubt thrashed about trying to get out. If you see a bug that looks like one you've seen in your yard, chances are that amber is 'manufactured' not made by nature. Also pay attention to 'flora' trapped in the amber, if it is perfectly placed, if it looks like a plant from your garden, this is a dead giveaway that this 'flora' was put into melted down product and then hardened. You can test the difference between copal and amber by applying a few drops of alcohol (or finger nail polish remover) to the item - Amber will be unaffected, Copal will become sticky. Copal and resin mixed Amber will melt down, real Amber doesn't melt, but burns away like an incense. Amber smells sweet when it burns, Fake amber will end up smelling like a burnt plastic. Copal and resin/plastic amber does not normally float in sea water, real amber normally does. But please be aware that many of the resin mix or plastics have had air blown into them during their manufacture, which does help them to mock the floating qualities of amber. In addition to this, if your real amber is full on inclusions, it will not float as well as amber without inclusions. JUST MAKE SURE YOU KNOW WHAT YOU ARE BUYING, AND IF IT IS REAL AMBER YOU ARE AFTER, BE PREPARED TO PAY HIGH PRICES. THE LARGER THE AMBER PIECE, THE HIGHER THE COSTS & IF IT IS GENIUNE NATURAL INCLUSIONS, GRAB IT AND KEEP IT IN YOUR COLLECTION, YOU'VE GOT A TREASURE. Know what you buy, ask questions and mostly remember some of these tips and trust your own eyes when you view the 'amber'. The best tip of all, is if it is beautiful to you and you just have to have it, then it will be a treasure no matter if nature or man made it. (just don't pay 'amber prices' for it) - I have a large chunk of Copal that I prize as highly as some of my Amber, because the natural inclusions are fascinating to me." In Ancient Greece there must have been a LOT of the stuff around as amber was used as incense. It is believed that amber smokes relax the body, refresh mind, make the immune system stronger and change the ion structure of air. The Ancient Greeks discovered that if you rub amber with a cloth (wool), it attracts paper, grass or feathers. The phenomenon was considered magic at that time. They called amber - "the holy stone". Tales of Millet pronounced that amber had its own soul. The word "electricity" comes from Greek "electron" - amber. Electron means - flashing and glittering. Scientists call amber "succinite", which came from Greek - tree sap or resin. The Ancient Romans called amber lyncurium, which means lynx’s urine. (You can see how ancient the word lynx is, 'lync' and 'urine,' also very old, i.e. urium. 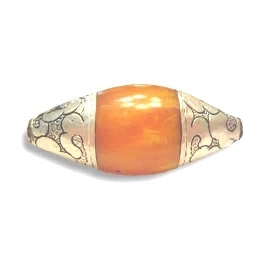 The Egyptian term for amber was - sokal, in Arabic - anbar, which came from its characteristic aroma. The name anbar originates from ambra - Arabic beloved fragrance. They believed that amber (and ambra) came from the bottom of the sea. It could be. It washes up on shores in the Baltic which means that part of the ocean in Pre Cambrian times was full of trees, i.e. dry land. Germans call amber - bernstein, which originated from brennender Stein - the burning stone. You can again see how ancient these syllables are, BURN and STONE. 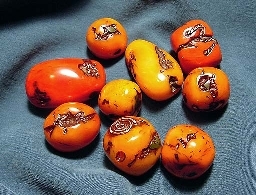 The Slavic term for amber - jantar is a version of Phoenician jain-tar - sea resin. In Lithuanian 'gin taras' means talisman. TAR is the word root there. Resin is tarry. Exciting to find contemporary words in languages thousands of years old, no? 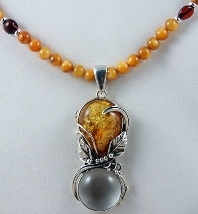 Slavs used to believe that amber (especially inclusions) brought luck. Amber was used to test virginity. A dubious girl had to drink amber brew. It was believed that a girl who had lost her virginity would urinate immediately after drinking the liquid. If they didn't cold call her, knocking on her door, the poor girl probably had a chance to have some strong, black tea on the sly. If the first gift from a man to a woman is made of amber, it means they will marry soon. WE GIRLS WISH! In the XVII century, the Slavs used to say about the dead, “they went to mine the amber”. Roman gladiators used to wear amber talismans with an inscription “I will win”. VINCIRE in LATIN type LETTERING might be great on a silver piece in your amber necklace. The Ancient Romans used amber to make artificial musk. Poles used amber as a medicament. Black amber was particularly valuable because it was supposed to drive off the devil, protect from black magic and snakes. It was also used to curse enemies. In the XIX century people still believed that amber could be used as a cure for rheumatism, heat, hysteria or spasms. Benet, an English doctor, prescribed amber for tuberculosis. German scientists managed to produce synthetic amber. It was marvelous, but quickly lost its color. Moreover, it was easy to identify, because it was heavier and sank in salty water. Amber does NOT sink in ocean water. As Amber is found around the Baltic sea, it frequently washes up on the shore which is where most of it is found these days. The citizens of Gdañsk donated an amber crown to Jan III Sobieski a Polish king. Krzysztof Macher, who was never accepted by the Amber Guild, was probably its creator. It was in February, 2000 that Dariusz Drabikowski and Prelate Henryk Jankowski decided to build the Amber Alter. According to project, the Altar will be made of 5500 pounds of raw material. The altar will be 12 yards high and almost 7 yards wide. The central part of the triptych will include a picture of the Holy Virgin. The Amber Altar will be a memorial to the laborers who died in Gdañsk in December 1970. This is something any amber fan will want to go see.